She has worked all over the world from LA to North Queensland and the Southern Highlands. Interior designer Nola Charles has now transformed her Central Coast apartment. Check out the before and afters. 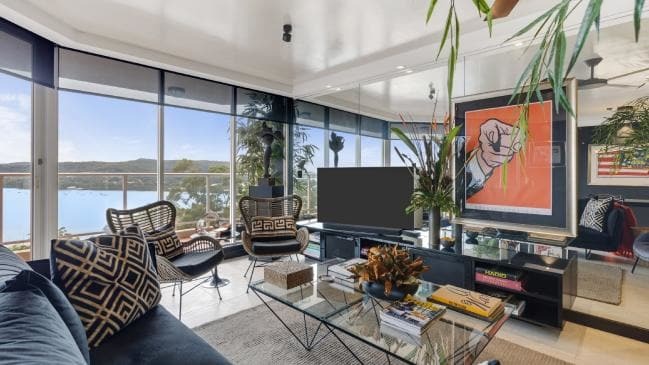 Nola Charles interior designer's Gosford apartment on John Whiteway Dr.
She has been an interior designer for 52 years, working on big country houses in the Southern Highlands, resort projects in North Queensland and recently doing some work in LA. 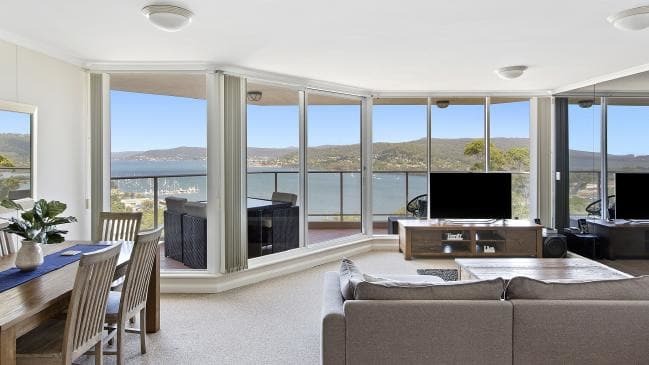 Nola Charles has now decided to put down roots in Gosford, renovating a 20-year-old apartment on John Whiteway Dr with sweeping views of the Brisbane Waters. 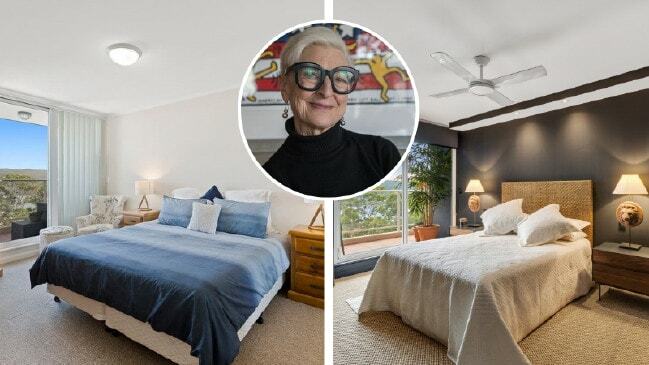 Purchasing the property with her husband for $645,000 in May last year, Mrs Charles said that the decision to settle was an accident of fate – the pair were looking for a renovation project, but when they saw the apartment, decided to make it home. BEFORE: The apartment was well-presented but neutral, with little character. AFTER: The main living area now includes signature design pieces. “We made a pact that we wouldn’t do it for re-sale – we wanted to bring out all the stuff we’d been storing - although I could fill another three or four apartments with my collections,” she said. 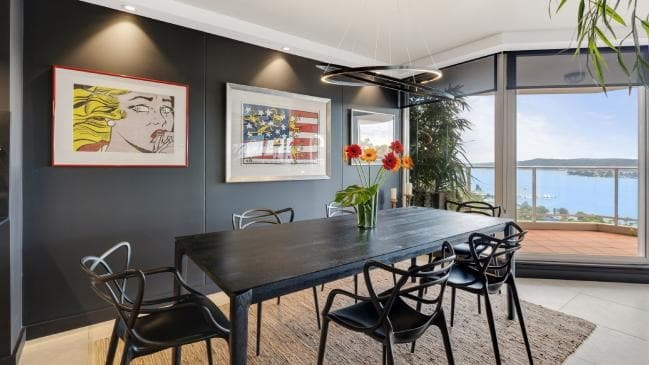 With a black colour palette, an Italian feature light and splashes of colour from her many unique artworks, Mrs Charles said that there was no other way to describe the apartment but a “John and Nola” design. “I’m an interpretative designer so I interview people and get into their headspace and design very specifically for them,” she said. BEFORE: The kitchen was dated and lacked pizzazz. AFTER: Features now include a hidden pantry and low front kitchen bar. The state of the original state of the apartment was certainly neutral. While it was in great condition, the carpeted apartment included beige walls an all-white kitchen and bathroom with dated cabinetry. The transformation is like chalk and cheese, with dark walls accentuating the view and design. 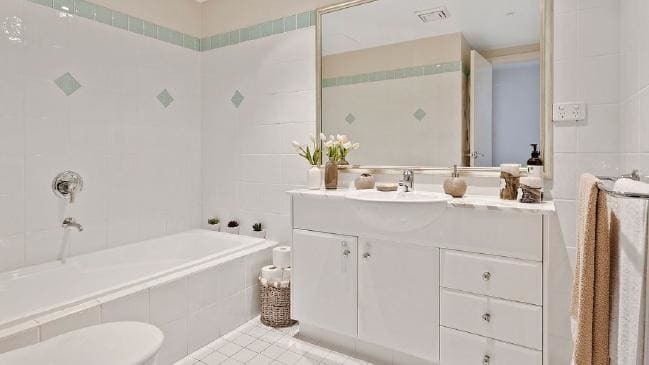 BEFORE: All white bathroom with mint tile pattern. AFTER: The new bathroom includes black tiled walls, a freestanding bathtub, black and timber textured vanity and a trendy hanging wall mirror. 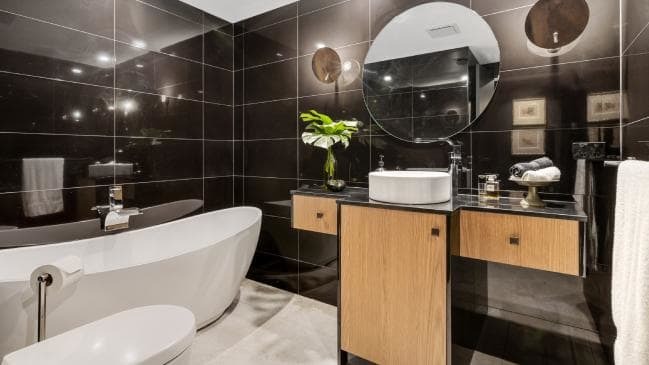 The main bathroom for example, features black tiled walls, a freestanding bathtub, black and timber textured vanity and a trendy hanging wall mirror. “The bathroom is like my sanctuary and we didn’t move any plumbing – proof you can completely transform without structural change,” Mrs Charles said. BEFORE: Nothing too eye-catching....apart from the view. AFTER: Check out the pop art and incredible hanging light feature. Another standout feature is the mirrored wall in the main living area, which Mrs Charles calls it ‘architectural mirroring’ because it is not meant to be noticed, designed to reflect the view and make it look bigger. 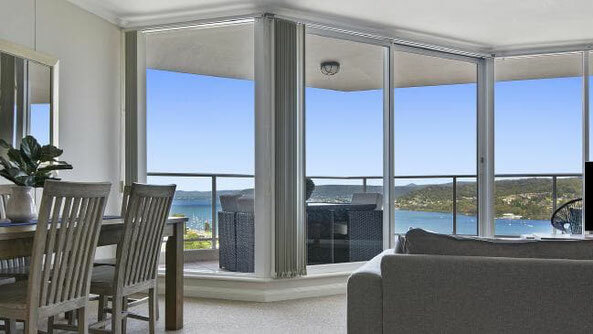 Real estate agent Blake Dunn from Raine and Horne Gosford sold the apartment to Mrs Charles and said that it had the best view in Gosford. “When they purchased it, it didn’t need any work, it was already quite nice, but they’ve just taken it to a whole other level. It is spectacular and unique,” he said. Contact Us For A Free Apartment Renovation Design Quote Today. We get back to you within two business days with kitchens and bathrooms quotation and the latest 3D Kitchen Design before you have decided which company to use for your home design renovation project. 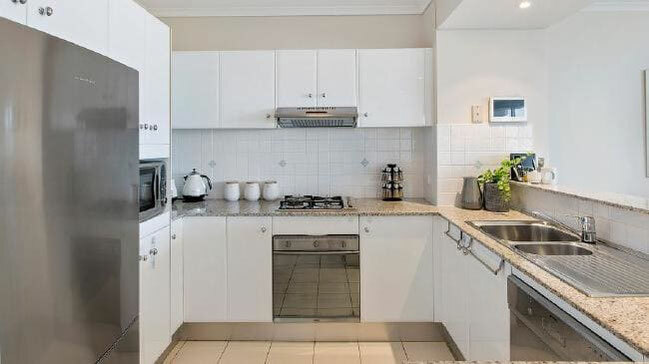 We provide kitchens and bathrooms upfront and fixed price renovation quotation and always define the scopes of works for kitchens and bathrooms design. If you don’t like the kitchens and bathrooms home renovation design and quotation, no further action is required, just simply walk away. 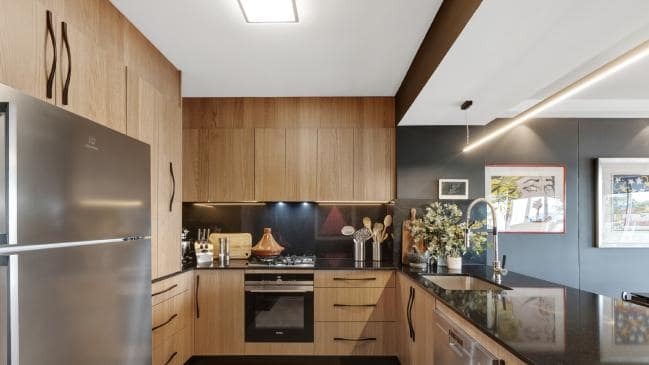 Copyright © 2010 - 2019 Sydney Budget Kitchens. All Rights Reserved.